According to Tetsuya Nomura, FFXV can only be a seamless gaming experience on next-gen systems like the PS4 or Xbox One. If you only know about about Final Fantasy XV from its E3 demo, you may not understand why people are so worked up about its previous name, Final Fantasy Versus XIII. To get up to speed, all you really need to know is that the game was announced in 2006, which means gamers have been waiting seven freaking years to get their hands on it. According to FFXV director Tetsuya Nomura, there's actually a very good reason for the delay: The game Square-Enix wanted Versus to be simply wasn't possible with PS3 hardware, so the entire development cycle had to be pushed into the next console generation. "With current-gen systems, we couldn't fully express what we wanted to do in this project," Nomura explained. "There were more and more things that we would've had to change the form of. However, the assumption was that we'd go ahead with a current-gen release, so went through a trial-and-error process to do as much as we could. So we built an alpha version about a year ago, and the company response was 'If you remained bound to the current generation, will it will be the product you envisioned?' They suggested shifting fully to next-gen, and that was the spark that led to the move." It's a little mind-boggling when you think about it. 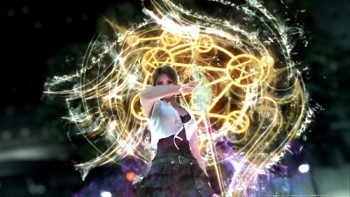 When FF Versus XIII was first announced in May 2006, the PlayStation 3 hadn't even reached store shelves yet. That means either Square-Enix's expectations for Versus shot through the roof during development, or Nomura was literally imagining a game two generations ahead of its time. "I wanted FF15 to be as seamless as possible, and to achieve that, we needed to have all the actions you could potentially do always be available in memory," Nomura said. "Keeping this massive amount of RPG character data around, and having them fight all kinds of monsters on a large map, is a lot of stuff. To that we're adding light sourcing, physics, filters, and other graphical elements, but there's only so much we could display at once, so we were forced to go through a weeding process." Square-Enix's criticisms of prolonged console generations make more sense now, since Nomura notes this was the main thing keeping Versus from being available sooner. "[The] lifespan of the current generation of consoles was starting to pose a problem to us. If we were a year later, other companies will have more time to research the next generation, and releasing the game against their products on the older generation could have caused us to look inferior when people inevitably compared us." So apparently Versus' delayed release was the fault of slow-moving console manufacturers the entire time. Nice job, industry.